Starbucks. I have mixed feelings about them. Sometimes they are good, sometimes really good, then occasionally they are so-so. It depends on your barrista and how fresh the baked goods are. Since all Starbucks bakery goods here are shipped from Southern California, the freshness can really vary. 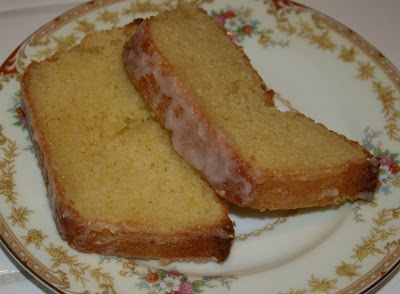 There was a stretch over summertime that I craved their lemon loaf and the closest café was always out. Then one day they weren’t out, but it was kinda stale. After much recipe research, I have hit upon one good enough to share. I have tweaked it a bit. I added lemon zest to mine. I was also concerned about how much the center would fall. Being at “High altitude” of 4400 feet above sea level, things usually cave in the middle unless you adjust things. This one still caved a little, but not as much as usual. It was still a hit for Sunday breakfast with both Justin and Eric. I overmixed it a bit so the texture was more like my Madeleines and the flavor of fresh eggs was noticeable. The icing really made it for me. 2. Combine dry ingredients in a large bowl – flour, baking soda, baking powder, and salt. 3. In a separate bowl, combine sugar and butter. Add eggs and mix. Add vanilla and lemon extracts, lemon juice, zest, milk, and oil and blend well. 4. Add wet ingredients to dry ingredients. Don’t overmix or cake will be tough. Lumpy batter is OK.
5. Pour into a loaf pan sprayed with nonstick spray. Bake about 40-50 minutes, or until toothpick poked in the middle comes out clean. Mine was done at 45 minutes. 6. Invert on cooling rack. 7. 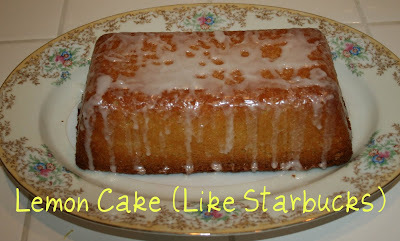 Meanwhile, mix up the powdered sugar, milk, and lemon extract to make the icing. Drizzle over the loaf. When cool, slice and serve. If you liked this, you might also like these recipes.